Having more than one child was something we always planned. I am really close with my sisters and want the same for my children, so we knew we wouldn’t be stopping at one baby. As Woody grew out of clothes, bouncers, beds etc, they were all packed up and put in the loft for when another baby came along. This has meant with Arlo’s arrival we have not needed to buy much at all. Poor Arlo has been living in mainly hand me down clothes, sleeping in a Moses basket which was originally mine and has had 13 babies sleep in it before him (my sisters and cousins), and sitting in baby bouncers and on mats which were originally bought new for his brother or my cousins. This has all been great for the bank balance!!! There were a few things I knew I wanted to get though for Arlo’s arrival. Not really because we needed them, but more because I fancied them as they looked useful. So I thought I would write a little blog post about these and how we are finding them so far. The first is the Sleephead Deluxe which my parents bought for us. I didn’t know about this product when Woody was a baby, but discovered it on Instagram and thought it looked like a good idea. We live in a 3 storey townhouse and so there are lots of stairs to walk up and down. When Woody was a tiny baby I would move his Moses basket or pram downstairs in a morning for him to lay in during the day, and then move it back upstairs in an evening. This was a faff!!!! So we have the Sleepyhead as Arlo’s day bed. It stays downstairs and Arlo uses it for naps during the day. In essence, its a little bed that gives the baby a hug whilst he sleeps. It means that if Arlo is having one of those days when he wants to be held, he doesn’t notice as much when I put him down when he is sleeping, which is great for getting some time to do jobs. We got this with the white cover on, which seems to be the most readily available option. However, having a toddler with sticky fingers, who loves kissing him little brother meant the white cover has needed to be washed a good few times to get the little jam/chocolate/snot marks off it. I got it another cover for times when it is in the wash, and chose one which has a navy zigzag stripe on it which is really nice. Another product I really liked the look of which we didn’t have before was massive muslin cloths. 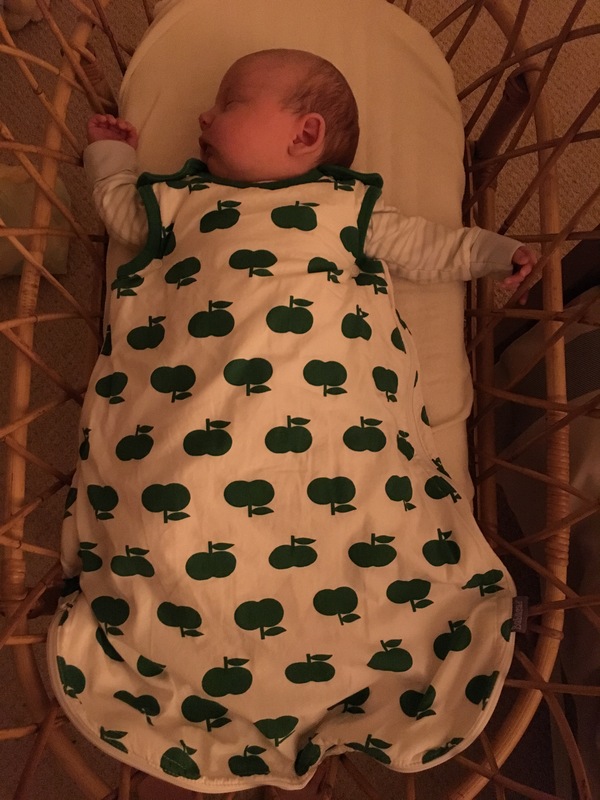 We had normal sized ones for Woody which we used constantly, however I saw some massive ones (again on Instagram) and liked the idea of using them for swaddling, floor mats, blankets, feeding covers and any other useful purpose they may serve. Below is a picture of Arlo modelling the ones I went for, the Aden + Anais Disney Baby Classic Swaddle with the Winnie the Pooh designs. They come as a pack of 4 and all of them are gorgeous. They are in constant use in our house now! When Arlo was first born I used them for swaddling- keeping his arms in close to him at night to help him sleep. I’m no longer swaddling him, but we use them as blankets during the day. 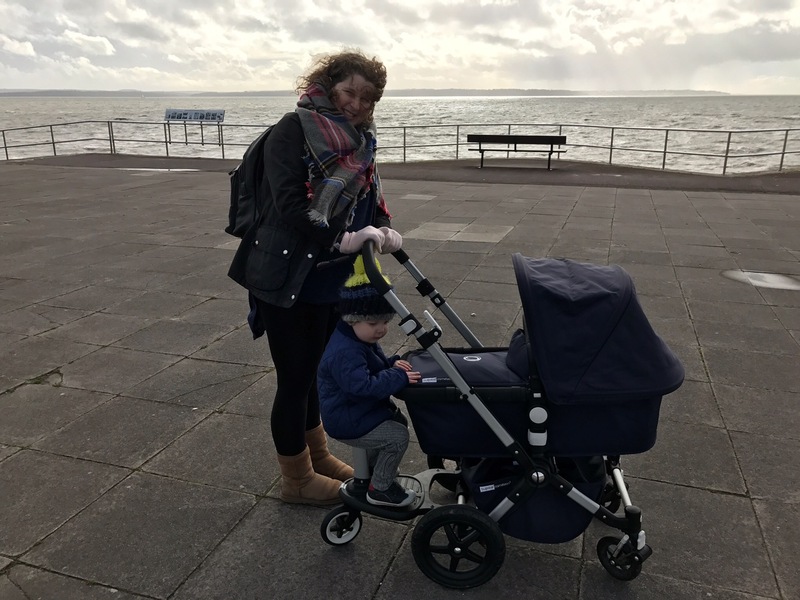 When making our first baby purchases we went for the bugaboo cameleon3 in navy. A bugaboo was the pram I always knew I would want when I had a baby and so it was an easy decision and one I have never regretted. It’s so easy to use, really easy to push around and Woody has always looked very comfy in it. Woody is a very confident walker now so we knew we weren’t going to need a double buggy and would get more use out of our pram. The option to attach the buggy board to save his little legs had been great though. Woody wasn’t too happy seeing us convert his pushchair back into a pram for Arlo, however the buggy board addition meant he has something new and exciting which was his. We now struggle to get him off it to walk around!!!! Everywhere we go we get people commenting on how good it is and asking us where we got it!! As modelled above, you can see I also got a new nappy bag! For Woody I had a pacapod nappy bag which was great. But with the two of them now and the buggy board I felt I needed a backpack style bag which wasn’t going to get in the way – Cue another Instagram purchase!!! I had noticed these lovely leather backpacks being promoted by many of the women/mums I follow on Instagram and thought I wanted one of those! This was definitely a treat to myself (I love a handbag!! ), but I felt I deserved it!!! I went for the Tiba & Marl Elwood Backpack in black. It has 3 sections- the main bag part which also has a divider so things can be put at the back (laptop, redbook, birth certificate….). This bit is really spacious and can fit loads in! I have put the nappy pod from my pacapod in here just to keep things seperate and means I only have this small pod to take with me to the changing room for nappy changes. There is then a smaller bit to the front on the bag which has an insulated bottle holder bit. This part for us currently contains toddler snacks and my purse. There is then a small zipped compartment at the very front for your phone and accessories (pack of tissues, lip stick etc!). It’s a really comfy bag to carry, and my husband doesn’t mind carrying it either as it’s not girly at all. A successful purchase!!! Finally, Mama designs is a brand I have loved since Woody was born. My first purchase from this brand was a grey cloud babasac (baby sleeping bag). The bag is multitog- 2.5 tog for the winter and then 1 tog for the summer when an inner quilted section is zipped out. We have since bought blankets from them and also a mama scarf. For Arlo I got a small grey cellular blanket and also I couldn’t resist getting our baby Appleton the apple babasac! I honestly thought I hadn’t bought that much, but writing this has made me realise I got a little more than expected!!! And also made me realise that I need to stay off Instagram for the sake of my bank balance (that’s not going to happen!)!! If you would like anymore information on the bits mentioned here then please let me know in the comments or on Instagram!! Posted in Family. Tagged babasac, babybag, babybed, babybuys, babypurchases, babysleepingbag, backpack, bugaboo, bugaboobuggyboard, buggyboard, mamadesign, maternityleave, mumofboys, mumoftwo, muslin, muslincloth, nappybag, newbaby, sleepingbaby, sleepyhead, sleepyheaddeluxe, tiba&marl.